Millicent Monks was born into one of the most famous families in America; her great-grandfather was the brother of Andrew Carnegie. Their fabled wealth enabled them to amass great houses and even private islands, but it was a dynasty torn apart by a succession of tragedies: suicide, alcoholism, and extremities of mental illness were passed on from generation to generation. For the women in the family, the consequences of this legacy have been painful. After a difficult childhood, the author’s daughter was diagnosed at the age of eighteen with what is now known as borderline personality disorder, a debilitating mental illness that was for the parents -- in the words of the novelist Sebastian Faulks -- "a public shame as well as private devastation." Like all mothers of children afflicted with this condition, Monks suffered from guilt and self-recrimination as she struggled to heal a disease that had no cause but for which she was held responsible. In the end, through the intervention of a wise Jungian therapist, meditation, and -- most important of all -- acceptance, the author achieves a self-insight that enables her and her daughter to arrive at a delicate peace. 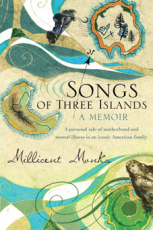 Songs of Three Islands powerfully demonstrates that we are not defined by our inheritance alone.